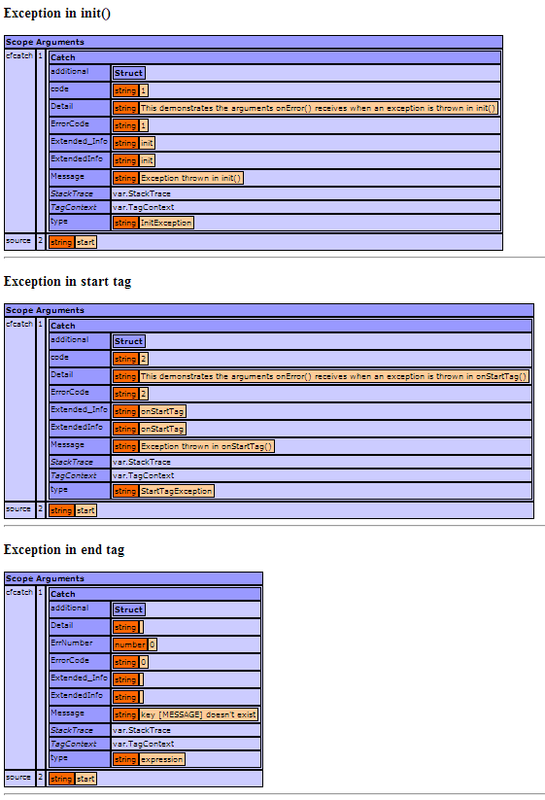 Tag CFCs have an onStartTag() method. This receives an argument containing all the tag's attributes, plus a reference to the caller scope. The function returns a boolean (more on that in a tick). Note that it's not just a case of not outputting "between tags": the content between the tags is not processed at all, not simply "not output". This could be handy if one was doing feature-toggling in views, or something. it returns a boolean too. On the whole one would want to return false here. If we return false from onEndTag(), processing continues after the end of the end tag. If we return true however, processing loops back to the start tag. Here we return true until the internal counter is greater than 5, at which point return false and let processing continue. This is quite a nice way of handling this; much nicer than using <cfexit> to perform looping (something called "exit" should not "loop"). We've added a new method here: init(). It runs before anything else (unsurprisingly), and receives whether the tag has a closing tag. 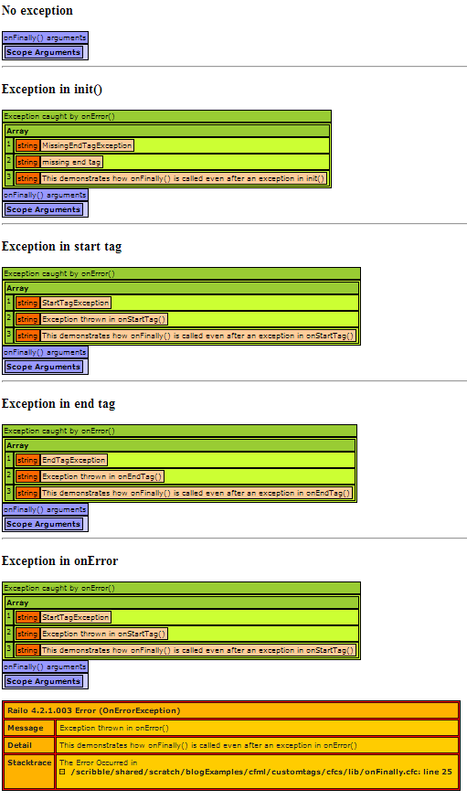 This demonstrates the first bug I have found in this stuff: an exception raised in onEndTag() is malformed. Errors raised in init() and onStartTag() work fine: all of type, message, detail, errorCode and extendedInfo all get passed fine. However onEndTag() seems to mess this up: it doesn't pass any of it correctly. I'll raise a bug for this. Anyway, you get the idea: onError() catches errors occurring within the CFC. Note that if one returns true from onError(), the original exception is rethrown. If one returns false: it's up to the code to deal with the error: processing will continue on its merry way after onError() runs. Railo also has an onFinally() method, which is roughly analogous to the finally in a try/catch/finally construct. I can't help but think onFinally() is a bit useless, as it doesn't get any arguments passed into it. I could see a case for it to everything all the other functions get passed into them. Otherwise it's very constrained as to what it can actually do. Same with onError() really. Also I think Railo give away that they're not native English speakers here. onFinally() makes no sense. It should just be finally(). When a function is prefixed with on, it's generally considered an event handler, for the event that it's named after. Like a click handler is onClick() or onRequestStart() when the request starts. The event describes an action taking place. "Finally" is not an action, and it's not an event, so onFinally() is wrong. Now that I think about it: onStartTag() and onEndTag() aren't great either: they are not event handlers really. I think doStartTag() or runStartTag() or processStartTag() would be better. But those almost make sense: onFinally() definitely does not. When a tag is called as a sub tag, its init() method receives an additional argument: parent. This contains the instance of the parent tag's CFC. One can enforce that a tag is being called as a particular tag's sub tag in two ways. The way I do it above. Simply define the parent argument as both required and of the specific type, eg: init(required boolean hasEndTag, required BaseTag parent) in this case. I opted to do it "my way" because the exception raised when doing it the second way is very generic (it's just of type "expression", I think), so not easy to error-handle. I wish Railo and Adobe would put more thought into this sort of thing. Error handling of CFML errors is not a pleasure to effect. That's at least a bit cool, yes? ... and provide a function to append a footnote to that array. And in onEndTag() in Footnote.cfc we append to the parent's footnote collection. This shows two-way data interchange with the parent, as the count of the footnotes is returned too. Here we use reduce() to reduce an array to a string, where the string is a series of <li> elements. Cool! One can do some nice stuff in CFML these days! I like the way Railo has implemented custom tags. It's got some blemishes and a coupla bugs, but on the whole it's a thoughtful implementation. Have any of you used 'em much? Tempted to now?